An interesting and enjoyable article, one I’ll keep tabs on over the flat season. Thanks for sharing. Thank you Pat, much appreciated. Enjoyable to pull together so glad you like it. Been doing some preliminary digging into this myself because in not a flat backer as a rule and I was planning to dip my toe in this season primarily using various mini-systems so thanks a lot for giving me some more avenues to explore. No problem DingDong – if you find anything of interest feel free to share it! Good luck! I agree, fascinating article and definitely something that I will be keeping in mind over the coming season. Did notice, though, not that I am criticising, no breakdown of the stats for Bin Suroor, though equally impressive and I am sure pertaining to middle distances. Again, great article, hope for more of the same in the future. Hi Dandy, thanks for the comments and no worries on referring to the lack of SBS stats. Simply down to trying to keep the article reasonably concise (with enough detail)! You’re right though, his record at 1m-1m4f inc is 32/98 A/E 1.32 and ROI 53% so worth keeping an eye on. 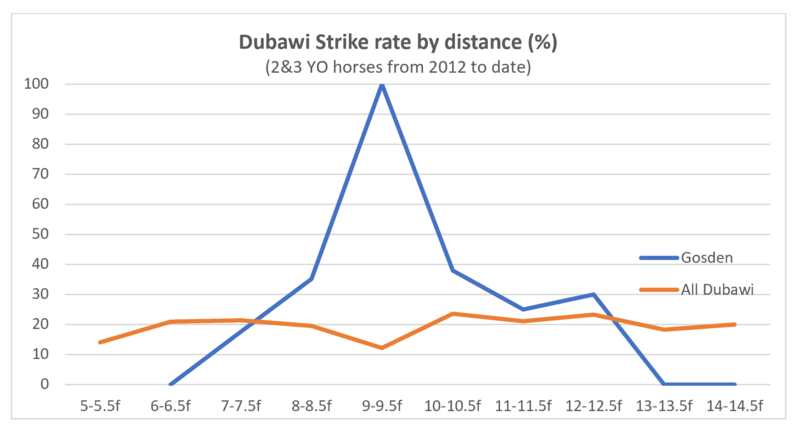 Interesting article – in the specific case of Dubawi, did you look at jockeys records, and in particular Frankie Dettori? I recall Frankie jumping off a winning horse last year that was by Dubawi and talking about how best to ride Dubawi and Dubawi progeny. 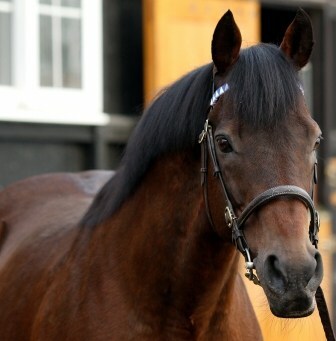 Maybe his record is better than other jockey on Dubawi’s progeny? Haven’t looked at this myself, but would be an interesting line of enquiry. Thanks Colin, I did look a little at jockey records. Certainly interesting, but I found it hard to find hugely robust angles. 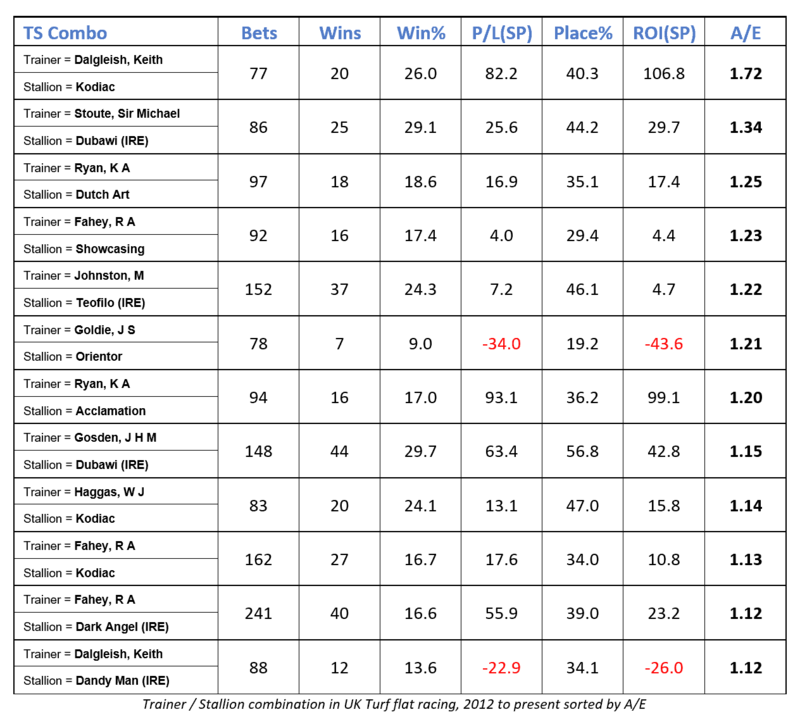 Frankie has 17 wins/64 runs, A/E 0.93 ROI -20% using races from 2012 onwards. Will Buick probably the brightest record 48/188 A/E 1.08 and 23% ROI. 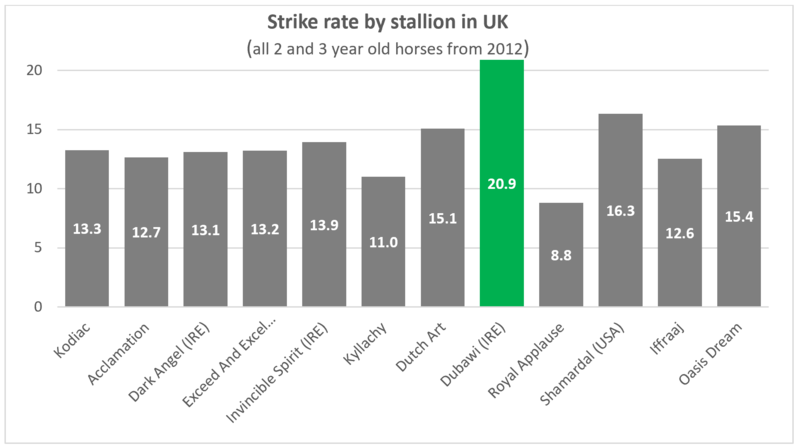 Hi Jon, as you would expect my focus in this area has been on sires of 2yos. I haven’t done any digging yet, but given Showcasing’s prolific 2yo win rate, 54% first crop and currently 39% all seasons I will have a deeper look. I know I that subconscious bells go off with certain trainer/sire combos so I will try and see if I can find anything solid to report. Beautifully interesting article, love this type of in-depth research. A joy to read and some real food for thought, I bet someone will pick this up and take it to an even deeper level (can’t wait to see that as well!). Thanks for this Jon.